The Midwest loves their meat so it should come as no surprise that Indiana is home to some of the most savory and spicy chicken wings in the country. This bar food favorite is the ultimate easy eat. For the very best wings, check out these 10 awesome eateries in the state. New York natives Al and Mary Baldassari moved to Fort Wayne, Indiana in 1966. Twenty-one years later, in 1987, they opened Buffalo Wings and Ribs. Locally owned and operated, BWB has been serving up some of the best wings Fort Wayne has to offer. The wings are juicy and crisp, and there are eleven different sauces to choose from. From Suicide or Suicide Garlic to Cajun Inferno, Shanghai Red and more, your mouth will water and you will feel your taste buds tingle with every bite! Add an order of curly fries on the side, and you won’t be disappointed! 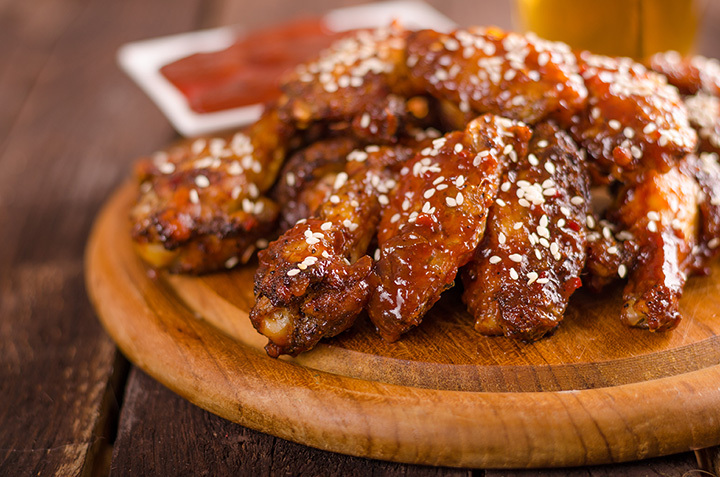 Home to the world famous Hermanaki Wings, the Ale Emporium in Indianapolis has been serving up wings for over 30 years. Whether you order the boneless wings or buffalo style wings, you’ll be fully satisfied with the portions and flavors. The regular boneless wings are lightly floured and deep fried, followed by being marinated in your favorite sauce, served with blue cheese dressing and healthy sides like carrots and celery. Even if you order a small order of buffalo, you get two pounds of jumbo wings (doggy bag please!). Try the wings Hermanaki style, or the Three-Mile-Island sauce. Both are absolutely delicious! For a healthier version of chicken wings, head on over to the Happy Chicken located on East 82nd Street in Indianapolis. The chicken is baked rather than fried, so it’s a healthier alternative. The wings are large and the sides are well portioned. Try the Happy Chicken flavor baked with a side of yellow rice and green beans. Happy Chicken is simple, home cooked goodness at its best and the best part? You won’t feel as guilty since their chicken is baked! BuffaLouie’s has been serving up some of the most iconic and delicious wings to the Bloomington area since 1987. Using only the freshest ingredients, with homemade sauces, and everything made to order, BuffaLouie’s is unique, and it is easy to see why it’s become a favorite of all Hoosiers, and why it was listed in the top 10 in USA Today. The wings are fluffy and crisp, with just enough tang and all of the sauces are homemade. Though BuffaLouie’s made its name with IU, it’s a favorite for everyone in Bloomington! Be sure to check it out! Sometimes it’s the little hole in the wall places that have the best food. J’s Wing & Seafood is one of those places. It’s not like Al’s Pancake World in Gilmore Girls where even though they’re supposed to serve pancakes, they serve everything but pancakes. J’s is another place in Indianapolis serving up some of the best, mouthwatering, juicy and delicious chicken wings, as well as seafood and other delicious options as well. Offering flavors such as lemon pepper, honey garlic pepper, and hot teriyaki, you cannot go wrong in what you choose. The prices are reasonable and the portions healthy. Head on in to J’s today! Welcome to Panoony’s, home of the BIG NOONY. Although Panoony’s Pizza and Wings is primarily known for its pizza in Brownsburg, Indiana, Panoony’s is also serving up some of the most delicious wings in southern Indiana. Panoony’s is locally owned and operated, and everything from the dough to the sauces are made in house. The wings only come in one size, Jumbo, so you’ll definitely want to consider taking some home with you. Try the salt and malt vinegar sauce, or the spicy oriental! R&R Extreme Wings are a bit unique in serving up their wings. Rather than going into a traditional restaurant, R&R takes their wings on the road in the form of a mobile food truck. Customer service is everything it should be, and it’s easy to see (and taste) why R&R is gaining popularity. The wing portions are incredible, and so are the sauces. If you like your wings extra hot, try the mango habanero or the hot habanero. For those who like their wings a bit milder, try the sweet and spicy or the panda orange. Sometimes the best places to find wings aren’t necessarily your typical wing joints. Let’s not forget that many times, the best place to find wings are at your local sports bars, such as Keystone Sports Review in Indianapolis, Indiana. The wings are juicy, delectable, and you’ll definitely need plenty of napkins before you’re finished. The sauces are the best part of KSR’s wings. From Redline to Cajun Dry Rub, Caribbean Jerk and Sweet or Spicy Asian Chili, let your taste buds take a trip around the world with these flavors. Not too many areas have a local pub or a good neighborhood joint anymore that offers quality service, a downhome atmosphere, and the best wings you could ask for. In Fort Wayne, Indiana, however, that’s exactly what the Tower Bar and Grill is. A neighborhood joint that offers quality service, the best wings you could ask for, and a downhome, friendly atmosphere. It may not look like much from the outside, but it’s definitely worth a visit! The lemon pepper flavored wings are among the most popular, but the citrus chipotle grilled come in second. And any flavor you want on your wings can also be grilled. Who doesn’t love grilled chicken wings? Yum! Chatham Tap is another local neighborhood pub, located in Indianapolis, Indiana (With another location in Fishers). In business for the last 10 years, their motto is “At Chatham Tap, you’ll never drink alone!” and it’s absolutely true. Chatham Tap is the place for sports and you’ll never run out of knowledgeable, friendly people to chat with as you devour some of the most delicious wings Chatham’s has to offer. Prince Dean’s Angel Wings, that is. Tossed in Chatham’s signature sauce and also available in barbecue, chipotle-apricot and other flavors, it’s a favorite among customers.